The accommodation consists of the ground floor of a large detached villa with private access and parking. It has its own secluded garden. internet service and can be accessed by a wifi connection. Outside,there is a patio with a large table, chairs and a barbecue. The fully-equipped kitchen features a hob, microwave, oven, washing machine, dishwasher and fridge/freezer. There is a round table with seating for 4 people. The master bedroom has a double bed plus room for a travel cot. There is a ceiling fan in this bedroom. The twin bedroom has two single beds plus room for a travel cot. The apartment also features a shower room with wash basin and a separate toilet and hand basin. Bed linen plus bath and hand towels are provided. Beach towels can be hired by prior arrangement. UTILITIES - GAS (hot water and heating) is chargeable by meters between the months of October to April inclusive. Payable at time of departure. PLEASE NOTE THAT THE GUESTS' COMMENTS PRIOR TO 2011, APPLY TO OUR PREVIOUS PROPERTY WHICH FEATURED A POOL. THIS PROPERTY DOES NOT HAVE A POOL. What to do in the area - 1: All along the coast there are resorts with promenades and long sandy beaches, or with coves and small harbours. Our favourite beach is Le Racou (Just south of Argelès). It also has an excellent tapas bar - Menj'Aqui - open during the season for lunch and dinner. The old coast road to Spain is quite exciting and provides really spectacular views. Dali's house at Port Lligat and the nearby fishing town of Cadaques are excellent destinations. There are many fascinating old towns and villages nearby including Ceret, Elne, Perpignan and Collioure, all of which have their historic buildings, traditional narrow streets, ancient monuments, quiet squares, local shops, weekly markets, restaurants and art galleries. Walking opportunities range from a relaxing evening stroll through Laroque to strenuous hikes in the mountains above the village. Guided walks are readily available. There are also Aquaparks, adventure parks, wild animal sanctuaries and many other outdoor activities for the family. What to do in the area - 2: There are many riding stables in the area running hacks in the mountains, along the coast or on the plain. If you feel like a change from French life, Spain is only a twenty minute drive along the motorway. The historic centres of Figueres and Girona are well worth a visit, as is the Dali Museum at Figueres. We have also really enjoyed the Costa Brava coastline and the idyllic coves and fishing villages, such as Sa Riu, Tamariu and Palafrugell. And if you tire of the coast, you stiil have the mountains to visit. A lovely trip is west along the Tech valley (south of Canigou) and over the Pyrénées to St Laurent de Cerdagne, with lunch at the Can Mach in Tapis or La Quadra in Massenet. The journey home can be via Espolla and the Col de Banyuls or via Llanca and the old coast road. You can also go up the Tet valley (north of Canigou) via Villefranche to the beautiful Capcir and Cerdagne regions. You can return via the N152 & La Molina, Ripoll, Camprodon, Prats de Mollo and the Tech Valley. Ski-ing in the Pyrennees: Our apartment makes a good low-cost base for a great choice of skiing and boarding in this area. There are 11 resorts on the French side of the Pyrenees. The nearest (Les Angles and Font Romeu) are only two hours drive away but all are within 3 hours. Les Angles, for example, is well run, with a fast cable car from 1600m up to 2400m. There is a chair lift to the mountain top at 2800m. The resort is great for beginners and intermediates and features 29 runs (many red and blue runs go from top to bottom); several green runs go from 2400 to 1600m. There are also 10 ski stations on the Spanish side of the mountains. The nearest again are about 2 hours drive, but all are within approximately 3 hours. If you want even more choice, then Andorra is about three hours drive from us. The property has a well-fitted shower room with wash basin and a separate toilet with hand basin. Several adult and children's games. The garden gets the sun all day, but has some pleasant shade. The windows in the apartment are double-glazed and are fitted with modern roller-blinds for shade and security. There is off-street parking for one car. We also have available a high chair, baby bath, baby walker, travel cot with bedding, booster car seat and some baby toys. You must request these when booking. Please note that we are beside one of the roads into the village, and there may be some traffic noise in the morning and evening. A Wi-Fi broadband connection available on request. Beach towels can be hired by prior arrangement. One of the most comfortable apartments we have stayed in, it felt like our home for the week. Well equipped, plenty of space and delightful private outdoor areas. We loved the village, plenty of restaurants to choose from and a good boulangerie for your morning croissants or patisserie later in the day. Patrick and Caroline most helpful when we had problems with our hire care, would love to return. Thank you for your lovely review. We hope to see you both again in Laroque. Nous avons passé un agréable séjour. Les extérieurs sont très bien entretenus, la maison est propre et très bien organisée. Tout est à disposition, "comme à la maison". Wifi performant. Nous recommandons vivement ce petit havre de paix et de repos. à louer sans modération ;-) . Thank you so much Vogler family. We look forward every summer to your visit. This was the third time we have stayed in the property. It really is home from home and Caroline and Patrick have made the apartment very comfortable. It is very well equipped - especially in the kitchen. 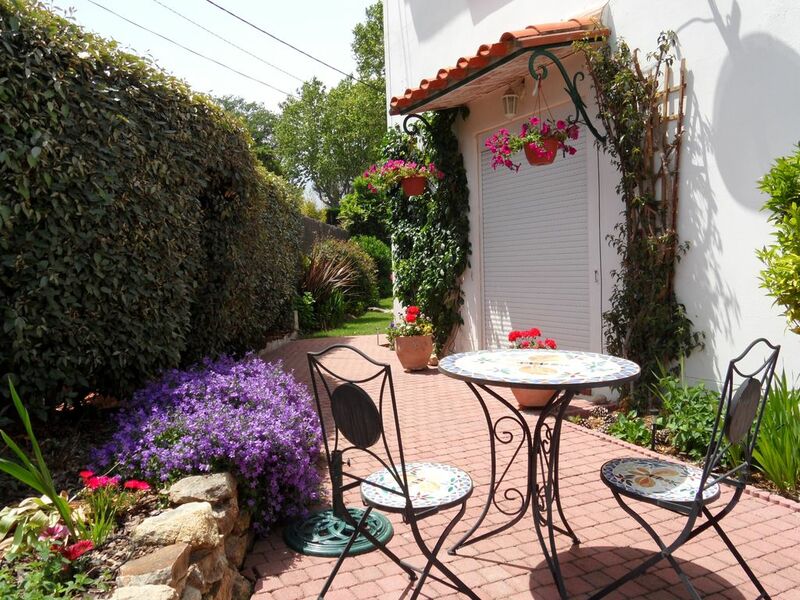 The private garden that comes with the apartment is very pretty and is also well equipped with table, chairs, garden loungers and an umbrella! An ideal spot for exploring the area in Winter or Summer. Thank you both for choosing us again for your French holiday. We always enjoy seeing you here and hope you come again soon! Comfortable, private flat in great location. Wanting a long-term base from which to search the property market was always likely to be a bit of a gamble but this flat came up trumps. The accommodation is spot on for size and comfort for the two of us. It is kitted out comprehensively and well-maintained, so we could settle into a home-from-home existence. The private colourful garden provides a lovely environment to sit out and the off-road parking is a boon when you don’t want your hired car to get scratched. But the real benefit is the location. Not just with the village and its excellent amenities being 7 minutes walk away (and 15 minutes stagger back!) but also the proximity to the coastal resorts, the mountains, the city of Perpignan and trips to Spain. Even the bottle bank is conveniently located just around the corner! Caroline and Patrick have been enormously helpful in guiding us around and giving tips, as well as being totally respectful of our privacy. We now look forward to a future relationship as fellow villagers. Thank you very much for your lovely review. We are so glad that you enjoyed your stay in our appartment and that your introduction to living in Laroque was so positive that you chose to buy here! Merci beaucoup pour votre gentille appréciation. C'était un plaisir vous recevoir ici à Laroque. Laroque des Albères is a medieval village situated in the foothills of the Mediterranean Pyrenees. The village is only 10km from the nearest beaches (Argelès Plage and Le Racou). Other attractive destinations are historic Collioure and the other resorts along the old Corniche road to Spain. St. Cyprien and Canet Plage ( twenty minutes drive to the north of Laroque) are also very family-friendly. The property is just five minutes walk from the village centre, where there are shops (including a small supermarket, two bakers, a butcher, a chemist and a take-away pizza bar), bars and restaurants, including a Micheliin listed restaurant. A larger Carrefour supermarket is within five minutes drive. The immediate area provides excellent walking and cycling, especially in the Albères hills above the village, where there are rock pools and waterfalls. Perpignan airport (Ryanair, Flybe, BMI) is about 45 minutes drive, Girona airport (Ryanair) 1hour and Barcelona (Easyjet) and Carcassonne (Ryanair) airports are about 21/2 hours drive. Golf: Golf in the Catalunya region:- The apartment is a 10 mile drive to the St.Cyprien golf course between Argeles and Canet Plage, which has both 18 and 9 hole courses. (18 hole course - par 73 at 6480m). There is also the beautiful 18-hole Domain de Falgos course (par 70 at 5047m) with views of snow-capped Pyreneean Mountains at the same time as the Bay of Roses. There are 9-hole courses at Amelie Les Bains (along the Tech valley, after Ceret) and Camprodon (along the Tech valley again, but on the other side of the Pyrenees, after Prats de Mollo). It is also an easy drive from Laroque to Figueres in Spain, where you can sample the Costa Brava courses at Torremirona Golf Club - 18 holes, par 72 and 6245m) and Peralada Golf Club which has both an 18- and a 9-hole course. Please contact us for more details. Long winter lets are available. Metered charges for gas, electricity and water will be made from October to April inclusive. The central heating, hob cooking and water heating are powered by gas and the oven is electric. A shared WiFi connection to the internet is available, which is also used to receive UK television.